Roman architecture took off right where the esteemed builders from ancient Greece left after the decline of Greek civilization. But unlike their predecessors, the Roman architecture gave far more priority to the practicality of their architectural designs. It was a major diversion from the contemporary practice which gave primary focus to a structure’s exterior design and aesthetic appeal. The Greeks, Persians and Egyptians before them had a number of monumental architectures, but their magnificence was limited to the exterior only. 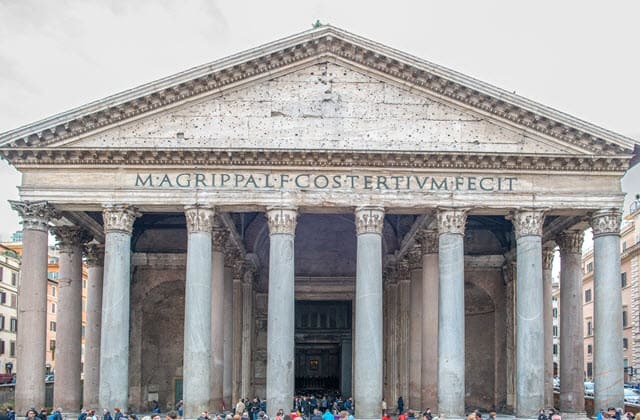 With the discovery of concrete, arches, and other engineering marvels during the ancient Roman era, the Roman builders could now build majestic architectures with internal structures that were previously deemed impractical and impossible. 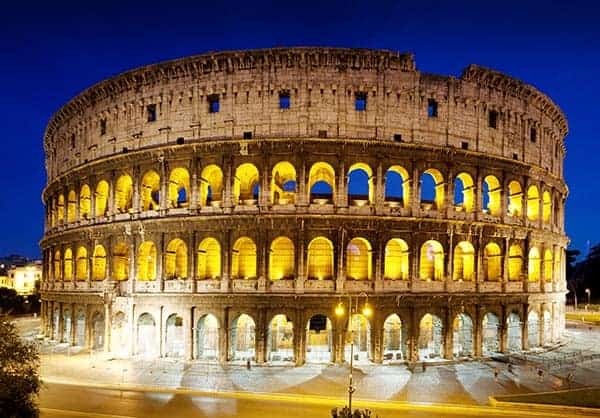 Here is a list of top 10 magnificent ancient Roman architectures that reflects the engineering ingenuity of the Romans. This monumental arch was constructed in 203 CE in recognition of unprecedented Roman victories over the Parthians in the dying years of 2nd century CE. It was under Septimius Severus’ rule that Rome was able to successfully suppress a raging civil war among the neighboring states. But the icing on the cake came when he immediately declared war on the Parthian empire and brought the Parthians to their knees. 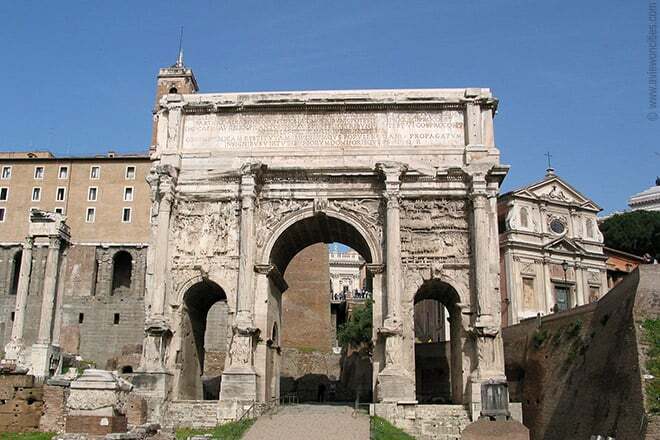 In recognition of his feats, the Roman senate had one of the most beautifully decorated triumphal arches erected on his return back in Rome. It used to have a bronze gilded inscription placed as homage to Septimius and his two sons Caracalla and Geta for having restored and expanded the Roman Republic. It was quite a unique triumphal monument by all standards in the contemporary Rome. Even today, despite some heavy damages, it stands tall as a lasting reminiscence to the once flamboyant Roman Republic. One of the major attraction and a remarkable archaeological site in present day Lebanon, Baalbeck is placed among some of the most spectacular wonders of the ancient world. It also happens to be one of the largest, prestigious and well preserved Roman temples built in the ancient Roman era. The first of the Baalbek temples were constructed in 1st century BC and in the subsequent 200 years, the Romans built three different temples – each dedicated to the god of Jupiter, Bacchus and Venus respectively. The largest temple among them was the temple of Jupiter, which had 54 titanic granite columns lined up – each giant column was around 70 feet tall. Although only six of those columns survive today, the sheer scale of their massiveness gives ample of reflection to the grandeur of Baalbek temples. 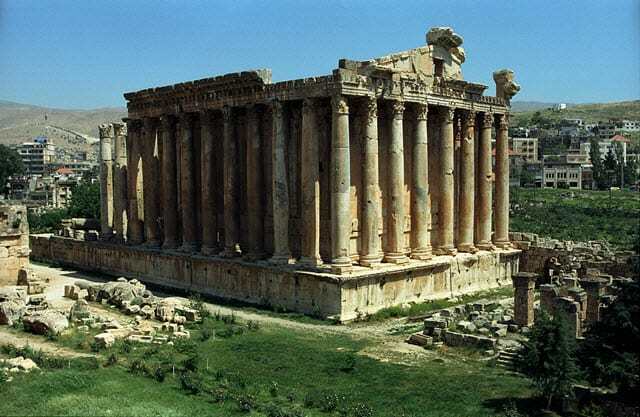 After the fall of Roman civilization, the Baalbek temples suffered from numerous thefts, war and natural calamities. But fortunately, it is still able to reflect its majestic aura to this day, with thousands of visitors visiting the famous Baalbek temples every year. Named after the famous former governor of the City of Ephesus, the Library of Celsus was actually a monumental tomb dedicated to Gaius Julius Celsus Polemaeanus. This amazing piece of Roman architecture was constructed under the orders of Celsus’s son Galius Julius Aquila. 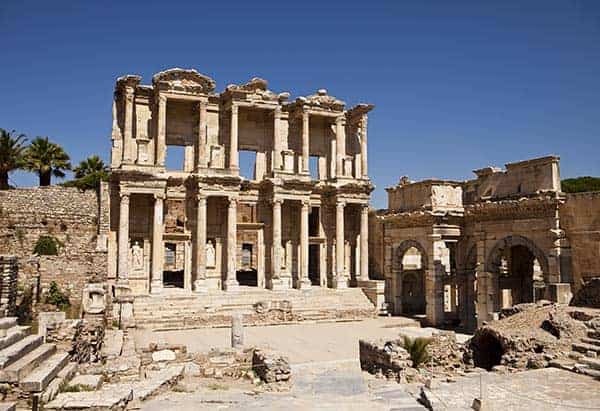 It was also a popular repository for important documents and at the height of its use, the library of Celsus housed over 12,000 different scrolls. It had beautifully carved interiors and equally mesmerizing architectural designs on the exterior – making it one of the most impressive buildings in ancient Roman Empire. The architecture of the library is typically reminiscent of the building style that was much popular during the rule of Emperor Hadrian. The entire structure is supported by nine-stepped podium which is 21 meters long. The surviving facade of the building retains its amazing decorations and relief carvings that simply add to the grandeur of the structure. Pont du Gard or the bridge of the Gard (a literal translation) is one of the surviving aqueducts constructed by the Roman Empire. Located in present day southern France, it was built somewhere in the middle of first century AD. This aqueduct was constructed without use of any mortar – the Roman engineers built this three storey masterpiece by fitting together massive blocks of precisely cut stones. These huge blocks of stones weighed up to 6 ton, and the bridge itself measured up to 360 meters at its highest point. Pont du Gard was a pivotal structure in an aqueduct that stretched over 50 kilometers in length. The success of this engineering marvel was essential to make the entire aqueduct functional which supplied water to the city of Nimes. In the end, the Roman engineers pulled off an outstanding feat in contemporary engineering and hydraulics. Pont du Gard was used as a conventional bridge all along the middle ages right up to the 18th century. Located on the Iberian Peninsula, the Aqueduct of Segovia still retains its structural integrity to this day, making it one of the best preserved pieces of architecture from ancient Rome. 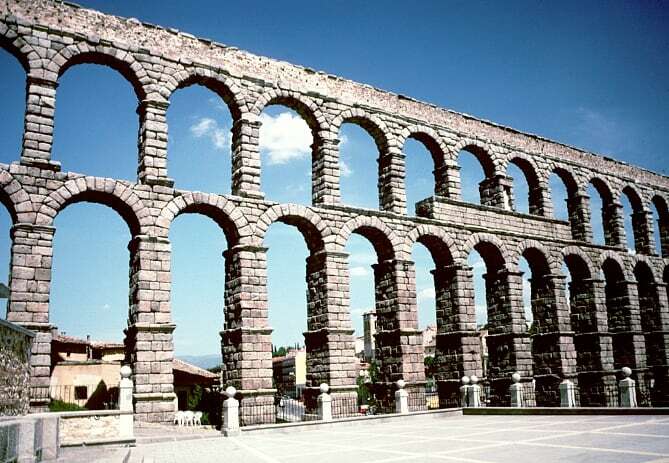 It was built somewhere around 50 AD to facilitate the flow of drinking water from the river Frio to the city of Segovia. On its completion, it was an unprecedented 16 km long structure built using around 24,000 giant blocks of granite. 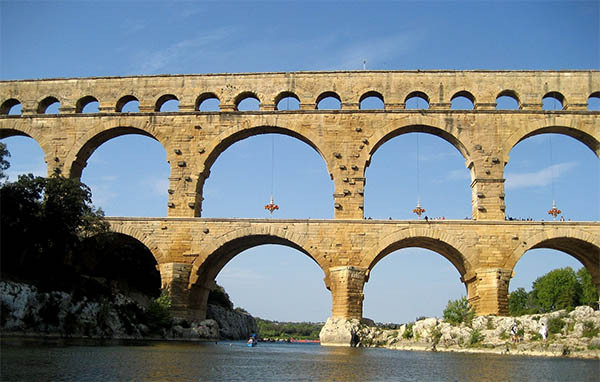 Just like Pont du Gard, the Roman engineers built the entire structure without using any mortar. With 165 arches all of which are over 9 meters in height, this architectural phenomenon has been a symbol of Segovia for centuries. The aqueduct had to go through an extended period of reconstruction during the 15th and 16th century after years of use and structural neglect. And by the 1970s and 1990s, some urgent and necessary conservation actions were undertaken to preserve the monument and its glory. Maison Carrée boasts of being the only temple constructed in the times of ancient Rome that is completely preserved to this day. This marvel of Roman engineering was built around 16 BC in the city of Nimes. Maison Carrée is an architectural gem that stands at 15 meters tall and runs along a length of 26 meters, it was built by Roman General Marcus Vipanius Agrippa in memory of his two sons who had died young. 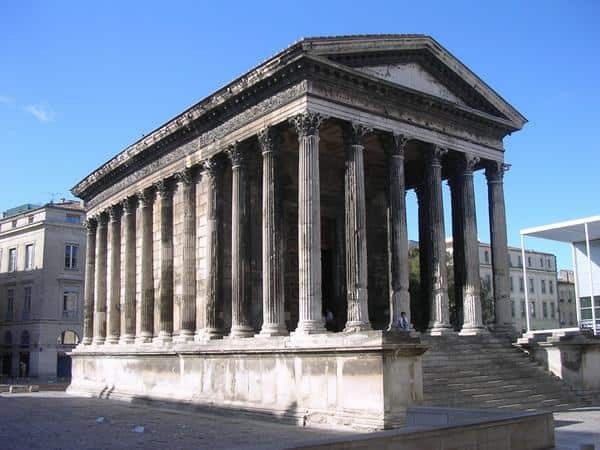 With the imminent fall of the Roman Empire on the horizon, Maison Carree was given a fresh lifeline when the rising Christian society decided to transform it into a Christian church in the 4th century. This decision largely spared this majestic temple from possible neglect and destruction as faced by many other Roman monuments and landmarks. Since then, it has been used for various purposes in subsequent years – as a town hall, stable, even a storehouse, and as a museum at present. 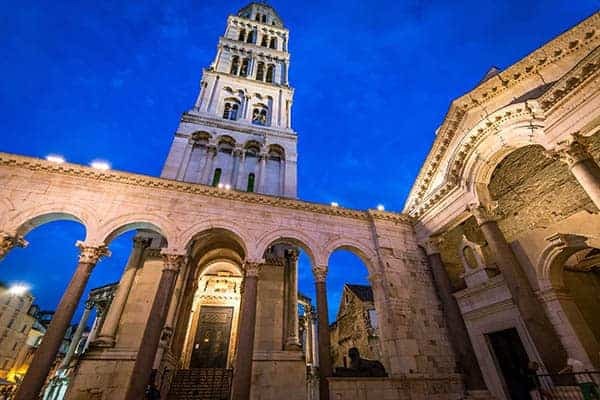 This marvelous building was built by the famous Roman emperor Diocletian as a preparation for his retirement. Diocletian was the first Roman emperor who voluntarily retired from his position, citing his declining health issues. After his retirement in May 1st, 305, he went on to spend a quiet life in this majestic palace, he had constructed as his post retirement abode. The palace covers around 215 meters from east to west and its walls are about 26 meters high. At a time when the Roman civilization was in transition from classical to the medieval era, the architects were able to envelope the different building styles that preceded it. It also helped that Christians used the palace as a cathedral in the middle ages – preserving its structural integrity throughout the medieval period. At present, Diocletian’s Palace is one of the most popular archaeological attractions in Croatia, and also a world heritage site as declared by UNESCO. 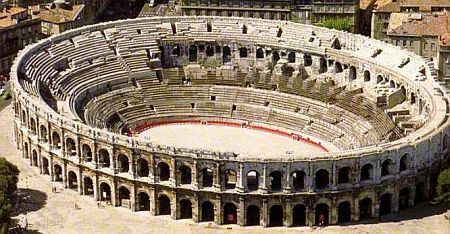 At the time when this famous amphitheater was built in the city of Nimes, the city was known by the name of Nemausus. From around 20 BC, Augustus started to colonize the city and give it a structure much similar to a typical Roman state. It had a number of splendid buildings, a surrounding wall over more than 200 hectares of land and a majestic theater at its heart. Better known as the Arena of Nimes, this astoundingly large theater had a seating capacity of around 24,000 spectators – effectively making it one of the biggest amphitheaters in Gaul. It was so spacious that during the middle ages, a small fortified palace was built within it. In the modern ages, somewhere around 1863, the arena was remodeled into a huge bullring. Since then it has been used to host the annual bullfights to this day. The Pantheon is arguably the most well-preserved architectural marvel from the ancient Roman era. Unlike many other contemporary Roman temples that were almost always dedicated to particular Roman deities, the Pantheon was a temple of all the Roman gods. The construction of this temple was completed in 125 CE during the rule of Hadrian. The Pantheon has a large circular portico that opens up to a rotunda. The rotunda is covered by one of the most majestic domes that simply adds a whole new dimension to the grandeur of the Pantheon. The sheer size and scale of this dome gives a lasting testimony to the skills of ancient Roman architects and engineers. The fact that this astounding piece of engineering stands tall to this day, withstanding 2000 years’ worth of corrosion and calamities speaks volumes for its built quality. When the famous amphitheater by the name of the Colosseum was built in ancient Rome, it measured at 620 by 523 feet in area – making it the largest amphitheater of its time. The construction of the largest and most popular ancient Roman monument was started during the reign of Emperor Vespasian in 72 AD. By the time its construction was finished by his son Titus in 80 AD, a never before seem amphitheater with a seating capacity for more than 50,000 spectators was ready for use. It could host such a large number of audiences that as many 80 different entrances were installed for ease of moving. It is said that on the opening ceremony, the grandest of spectacles were held for about 100 days. In that period of time, about 5,000 animals and 2,000 gladiators fought to their deaths in an unprecedented extravaganza of gladiator and bestiarius battles. Ancient Roman architecture in many ways is unique from the buildings and monuments from ancient Greece and Egypt. Of course, the Roman constructions were as grand in terms of scale and magnificence. But they were also far more practical in comparison to all the preceding architectural designs. And then, with the advent of Roman concrete, arches and other ingenious engineering ideas, the ancient Romans were able to take their architecture to new heights. We don’t have to look beyond monuments like the Colosseum, Pantheon and those spectacular aqueducts that survived couple of millennium courtesy of their impeccable built. Thank you for your blog. I am currently completing my doctorate degree, and required info about ancient Roman structures. I appreciate your writing style, photos, and historical acumen.